This MasterPieces 18" x 24" 750pc Lazy Days Puzzle was created by the talented Alan Giana. Alan Giana's paintings of colorful paths, charming country hideaways, and tranquil coastal waterways touch the hearts of people everywhere. His inspiring paintings now appear on hundreds of products sold all around the world. Alan lives with his loving wife, Pamela, in the picturesque town of Simsbury, Connecticut. Lazy Days puzzles are full of breathtaking scenery and effortless beauty. 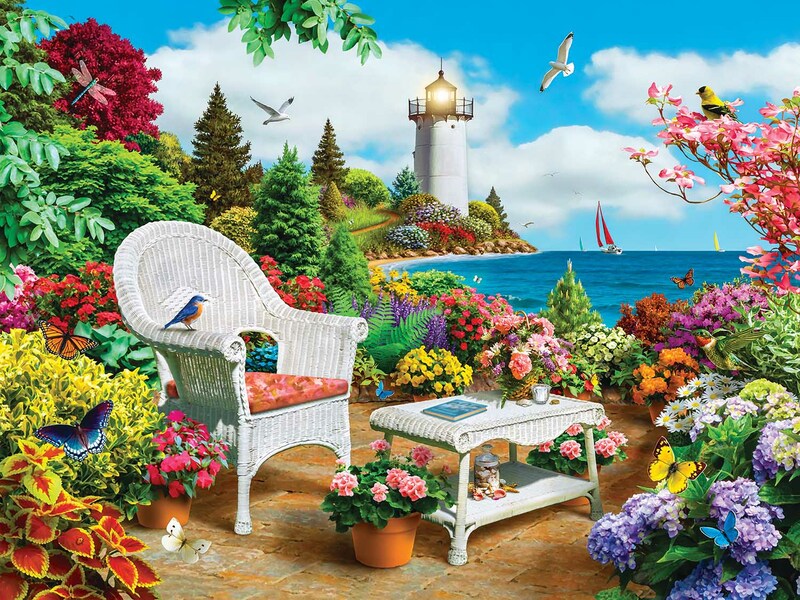 This image features the porch of a beautiful seaside getaway, with a cozy reading chair, a colorful garden, a perfect view of the water, and a magnificent lighthouse in the background. To reduce its impact on our environment, the chipboard used in this puzzle is made of recycled material. Je n'ai encore RIEN REÇU, alors les commentaires vous les aurez .... oups J'IGNORE QUAND ! ! ! I bought the puzzle as a thank you gift for a friend. Apparently, she liked it because she started working on it the moment she opened the box! enjoy doing masterpieces puzzles-great quality!